Irving Rosenfeld (Christian Bale) meets and falls in love Sydney Prosser (Amy Adams), and they start up a money lending scam, with Sydney under the alias of British aristocrat Lady Edith Greensleigh. They are soon confronted by FBI agent Richard DiMaso (Bradley Cooper), and are utilised into scamming and bribing corrupt politicians, including the Mayor of Camden, New Jersey, Carmine Polito (Jeremy Renner). However, this plan is complicated by a number of things; Irving Is actually married to the manipulative Rosalyn (Jennifer Lawrence) who has the capacity to bring the whole thing down; the fact that Irving develops a strong friendship with Carmine, resulting with powerful guilt; and Richard falling madly in love with Sydney, who he still believes is Edith, causing jealousy in Irving. But, can the con artists complete the mission, and get out of it on top? Now, David O. Russell is one of my personal favourite directors. I began following him with the simply incredible The Fighter (2010), which also sported Bale and Adams. My love for his work was then wildly increased with the equally as great Silver Linings Playbook (2012), which also had Lawrence and Cooper. So, with a talented director working with familiar faces, my hopes for this film were extremely high, only boosted by its seven (that's right, you count 'em) Golden Globe nominations. But, and I say so with great, great pleasure, American Hustle deserves every last one of them. The cast here are extraordinary; O. Russell's last film gained Academy Award nominations in all four acting categories, and there is a strong chance he could manage that feat again here. With five big names all playing big roles, and a great script for them to bounce off, each and every one of them has a huge personality. Bale and Adams are so believable with their love affair, yet when Lady Edith runs off with Richard briefly, we believe that too. Renner himself is slightly underused, and doesn't really have enough screen-time to show off how good of an actor he can really be. However, and not to me surprise, this film is stolen by Jennifer Lawrence, who, as ever, shines through in every single scene she is in. Her comic timing is flawless, and this is a role far from anything she's done before, yet you'd think she's been doing this stuff for years; sometimes it's easy to forget she's only 23. American Hustle just reaffirms her position as, in my calculated opinion, the greatest actress in Hollywood at the moment. But, praise must also be given O. Russell's screenplay, which allows the film to be both impressively complicated and intelligent, but also simple to follow. There is a lot going on for this film's final act, but you will understand what you're meant to understand. O. Russell keeps certain justifications hidden under the final moments, in a way he is hustling us while we watch it. But, by the big reveal, there are no disappointments. The characters are all given their own send-offs, every plot point is wrapped up. For a film with such a multi-layered narrative, with so many subplots and so many central characters, this is no easy feat. But it works. Also, before I got to see this film, I was confused as to why it had been placed in the "Musical or Comedy" category for the Golden Globes. Now, I understand. Whilst the concept of the film is pretty serious, and something you'd expect to find in a straightforward drama/thriller, O. Russell has layered the script with some truly brilliant comedy, and it gives the film a much more light hearted feel, which isn't necessarily a bad thing, due to the complication of the story. I mean, seriously, the level of laughter in the screening room I saw this in is what you expect from a pure comedy film. Whilst the main comic relief of the film is Lawrence's Rosalyn, almost every character has some brilliantly funny scene. This makes us like these characters more, as it is very much a character driven film. Sure, it's heavy on plot, but there is no action here; the plot can only be driven by the characters. So it's a huge relief that they are so well defined. American Hustle may not really break new ground, and it does take a while into it's over two hour runtime before the story first developments and the comedy picks up, but when it does, you'd forgive almost any flaw it had beforehand. O. Russell's direction here is possibly the best it's ever been. He's surely in with an Oscar nomination, as is the film for Best Picture. I'd also love to see all the cast up for something, but Lawrence is bound to get her third nomination in four years. It'll be up for Screenplay, and it'll get nominated for make up and hairstyling, too. Basically, American Hustle is highly likely to be highly rewarded come the Oscars next month. Could it take home a vast handful of trophies? Really, I wouldn't put it past it. 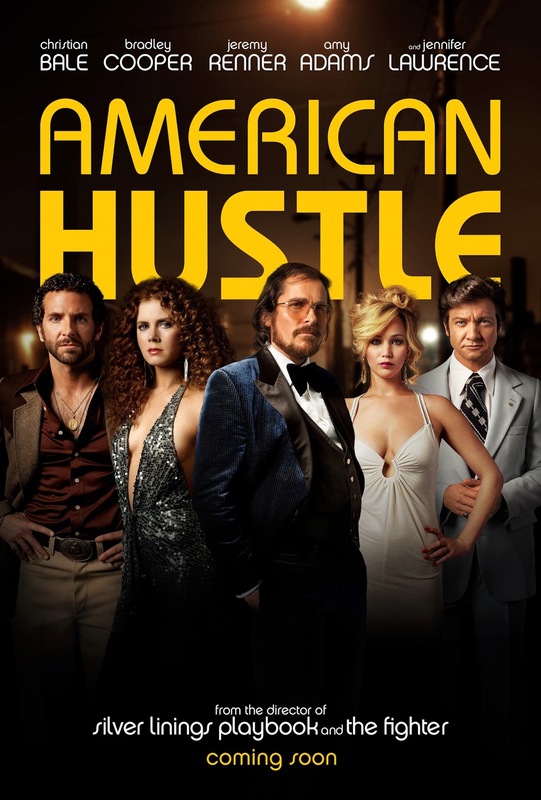 To Summarise: Bold, stylish, and wildly funny, "American Hustle" finds that perfect balance between entertainment and intelligence thanks to its strong direction and incredibly talented cast.